Jean-Luc Godard dissects the structure of society, movies, love and revolution. He asks compelling questions: Can love survive a relationship? Can ideology survive revolution? He also looks at the French student riots of the 1960s with a critical eye, and ends up satirizing contemporary views of history. A battery of thoughts complete with criticism of modern society and movies. Godard’s return to mainstream film-making after his self-imposed four-year Marxist-nihilist exile is a sort of auto-critique, craftily type-casting Fonda and Montand as media intellectuals (she an American journalist, he a former New Wave film-maker now working in commercials) who eagerly committed themselves to the revolutionary struggle in 1968, but are now led to revise that commitment (and their personal relationship) through their involvement in a factory strike in 1972. A little simplistic at times but acidly funny, with Godard’s genius for the arresting image once more well to the fore. 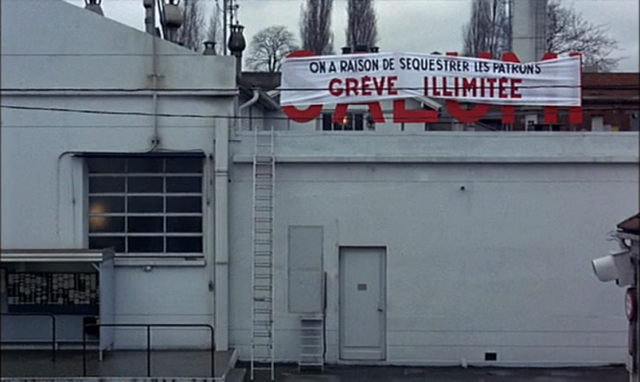 Tout va bien’s announced purpose was to “consider the class struggle in France four years on from 1968.” And as the culmination of Godard’s political period, the movie is highly reflexive. Indeed, Tout va bien’s autocritique begins almost before the movie itself. “If you use stars, people will give you money,” an off-screen voice opines amid a flurry of filmed check-signing. True: Thanks to the participation of Jane Fonda, who plays an American radio journalist in France, and Yves Montand, as her filmmaker husband, Tout va bien was financed by Gaumont. (For a time, Paramount was interested as well.) To drive home the point, Fonda and Montand are introduced quoting lines from Godard’s previous star-driven commercial feature, Contempt—a parody for which Gorin later took credit. As cinema, Tout va bien is radically simplified and blatantly diagrammatic. 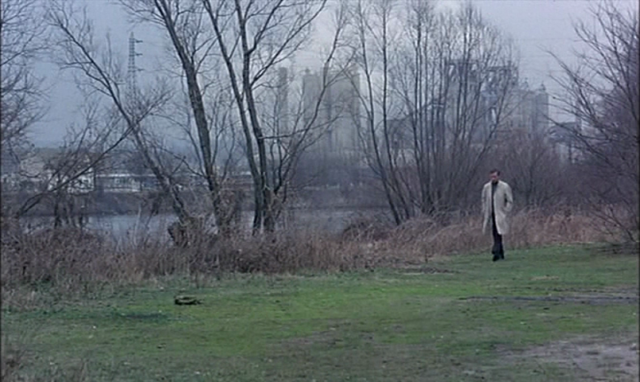 After the opening sequence, the Fonda character arrives at a sausage factory to do a story on modern management techniques. Montand tags along, and, as the workers have just staged a wildcat strike, the visiting celebs soon find themselves “sequestered” with the factory’s clownish boss. The approach is self-consciously Brechtian: The characters frequently address the camera. These characters are characters and the set on which they appear is an obvious set. 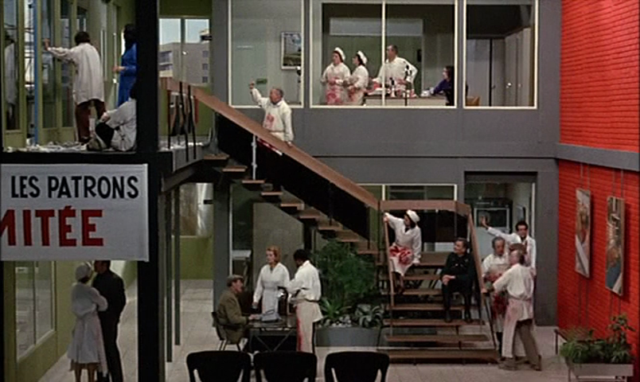 This two-story, open construction—evoking the cutaway girls’ school in Jerry Lewis’s The Ladies Man (1961)—is, if not Vertov’s “factory of facts,” then at least a factory for making meaning. The comic-book frame allows the filmmakers to analyze the strike as a sort of Rube Goldberg contraption and put a didactic emphasis on working conditions. Tout va bien insists on class struggle throughout but is mainly about radicalizing its stars. Their role in the factory is to look and learn. Indeed, Godard and Gorin upped the class-resentment ante by having the striking workers played not by real workers but by unemployed actors. After a day and a night, the stars are released. What knowledge have they gained? Montand’s character, who was once a nouvelle vague filmmaker, undergoes a period of self-questioning, then returns to shooting TV commercials. Fonda realizes that, as an American correspondent in France, she “corresponds to nothing” but at least begins to rethink her relationship with Montand. A final set piece, unfolding in a large, modern supermarket, shows another manifestation—workers and students begin liberating consumer products and, as the camera executes a series of long, lateral tracks back and forth, ultimately riot. This is not quite the final word: a brief coda runs some variations on the fate of Fonda and Montand’s marriage. Opening in Paris on April 28, 1972, Tout va bien was, per Colin MacCabe, “a critical and commercial disaster.” Scarcely more than two months later, Fonda gave the most controversial performance of her career: July 8, she deplaned an Aeroflot jet in Hanoi, where she made ten broadcasts on behalf of the North Vietnamese government. Once the story broke, Fonda became an issue in the presidential campaign—the antiwar activist Nixon supporters most loved to hate. Tout va bien had its U.S. premiere, a few weeks before the election, at the New York Film Festival. Misleadingly promoted as Godard’s commercial comeback, the movie was tepidly received. I vividly recall my own youthful disappointment that Tout va bien was not Weekend. (Of course, as Tout va bien makes clear, 1972 was not 1968.) Nor did many appreciate Fonda’s game and stellar turn. She’s “most appealing (and very funny) as a solemn American political correspondent who becomes radicalized after being trapped overnight in a strike in a Paris sausage factory,” New York Times critic Vincent Canby wrote in one of the movie’s few favorable notices. 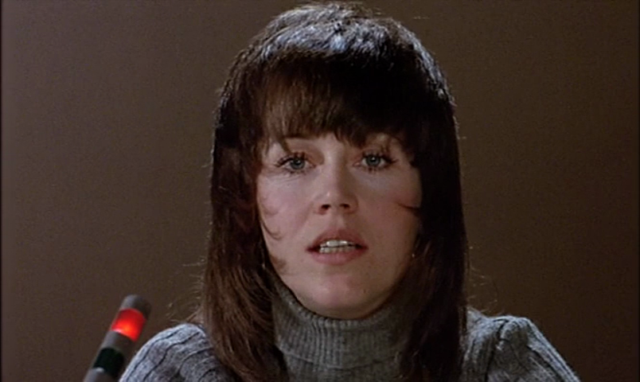 Her hair still in the stylish shag cut that she popularized with Klute, Fonda gives a forceful, tense performance. Speaking in French throughout much of the movie, she enjoys her finest moment in a lengthy domestic argument with Montand, during which she is brandishing a photo of male genitalia. Also on the bill was Tout va bien’s unauthorized sequel, Letter to Jane. 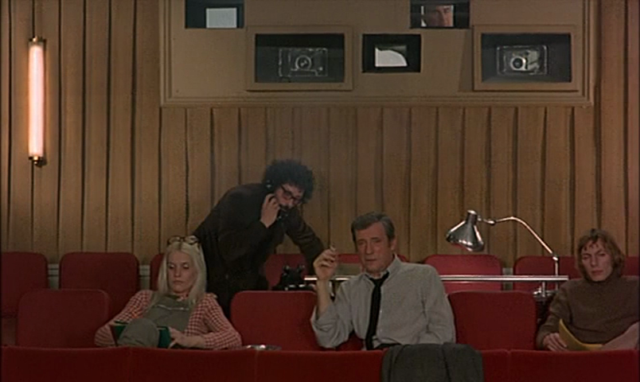 Godard and Gorin’s last collaboration was a remarkable kiss-off…to Fonda. Fred Gardner, a onetime political comrade of Fonda’s, would recall that it was “not pleasant” watching people relate to her: “Everybody wanted something—money, an appearance, a favor, a quote, a picture, a connection, a mention, an endorsement. At the same time, they bombarded her with charges of ‘elitism’ designed to maximize her guilt.” And so, Fonda was punished by her erstwhile directors in their extraordinary analysis of a single news photo taken during her trip to Hanoi. Narrated by the filmmakers and condescendingly addressed to “you, Jane,” Letter poses the same question as Tout va bien, namely the role of the movie star in the revolutionary struggle. Alternately brilliant and obtuse, the film’s disingenuous analysis assumes Fonda as author of the photograph—responsible for everything from the camera angle to the caption that erroneously describes her as asking a question. 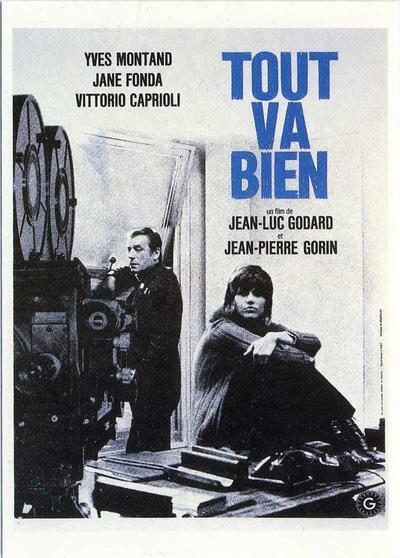 That Tout va bien was received as a failure while Letter to Jane, however mean-spirited, was recognized as the most formally adventurous of the Dziga Vertov Group films may account for Godard’s crediting Tout va bien mainly to Gorin and Letter to Jane mainly to himself (as reported by Andrew Sarris in the Village Voice). 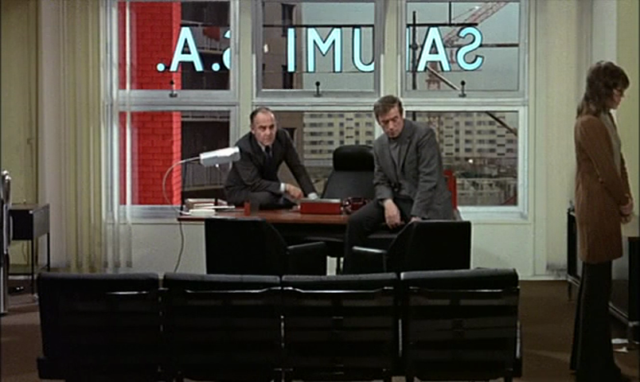 Given Godard’s ailments during production and Gorin’s constant presence on the set, not to mention his loving references to sixties Godard, it might be more accurate to call Tout va bien as much a “Godard” film as a Godard film. 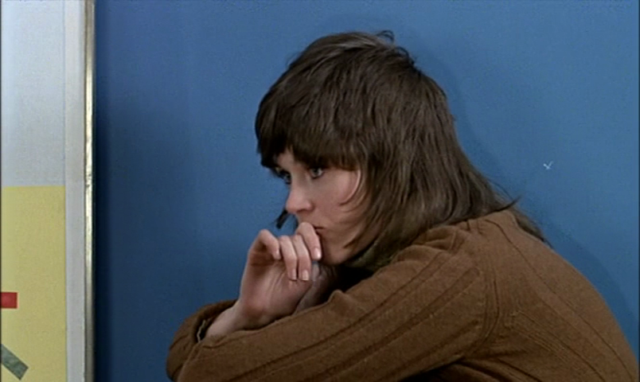 Three decades later, Tout va bien seems more integrated into Godard’s oeuvre—a bridge between the similarly elaborate and Brechtian “musical” A Woman Is a Woman and the more straightforward Passion, which, although less concerned with politics than art, is another love story set in a factory. Tout va bien, which plays with the idea of recording working-class history as it is happening, may also be seen as the enabling precursor to Peter Watkin’s 2000 historical epic La Commune (Paris, 1871). It is, in any case, a far better movie than it seemed, at least to this former and then skeptical hippie, back in the day. — This rather strange interview shows us JLG, unshaven and in a bath robe talking about Tout Va Bien and the intentions they had with it. Although it’s only 7 minutes, Godard gives us a great deal of information about his ideas on film and the relationship between the workers and filmmakers……very interesting. — In 27 minutes Jean-Pierre Gorin talks about his collaboration with Godard, what the intentions of the Dziga Vertov group were (to make films politcally, not to make political films), how they worked and how their joint-venture ended. Of course it deals specifically with the making of Tout va Bien and Letter to Jane. It is a nice start for my biggest release ever.